The low-value edible berries first made their appearance August 5, 1992. The designs were the first Canadian low-value definitives to have the design appear continuous across the pane of stamps (pane of 100). All but 2 values have been reprinted 3 additional times. Unfortunately, when only a single stamp is available, only 2 of the 4 printings can be identified - by use of paper identification. To identify each of the 4 printings of a given stamp you will need a corner inscription block. The inscription indicates the printer and paper. The Coated and Harrison paper varieties can be distinguished on single stamps. Click here for a discussion of identifying modern-day Canadian postage stamp paper. Your initial studies of these differences may prove difficult. However, once you pick the identification methods, it will become relatively easy to separate the different papers. Many constant plate varieties exist on these stamps. The 2c and 25c values each contain the same plate flaw! There is a small plate scratch near the right edge of the design, just below the denomination. It occurs on the stamps in the first column (rows 2-10) on the last 3 printings. Thus, there are 9 stamps on a pane of 100 on 3 different printings on 2 different stamps! On the 2c value, the "horizontal" scratch falls in the rightmost bush (dubbed "Snake in bush"). 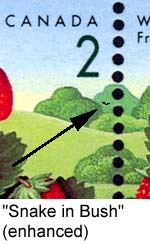 On the 25c value, the scratch falls in the distant field ("Snake in field"). Imperforate pairs of many of these values have surfaced. However, it is thought that these are "back door" items from the printers (Ashton-Potter). A number of questionable imperforate errors began to surface in the late 1990's, all from stamps printed by Ashton-Potter.